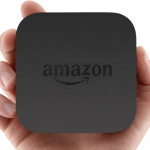 If you have ever purchased an e-book through Amazon, a credit may be waiting for you. The refund is your slice of a $166 million e-book price-fixing settlement that was approved by a U.S. federal court last December. 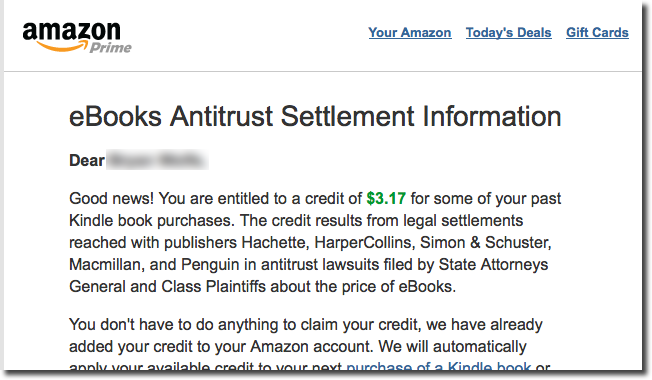 In an email being sent out to customers, Amazon says the credit “results from legal settlements reached with publishers Hachette, HarperCollins, Simon & Schuster, Macmillan, and Penguin in antitrust lawsuits filed by State Attorneys General and Class Plaintiffs about the price of eBooks.” The credit, which is automatically added to your Amazon account, can be applied to purchase any book through amazon.com, regardless of the publisher. The credit expires on March 31, 2015. If you haven’t used your credit within 90 days, another email will follow. Credits are for qualifying Kindle books purchased between April 1, 2010 and May 21, 2012. Though Amazon has settled, Apple is still fighting the courts over its involvement in e-book price-fixing with America's largest book publishing companies. Those publishers, which have all reached settlements with the U.S. government, admitted they colluded to set an inflated price on e-books soon after the first iPad was released in 2010. For more information, visit amazon.com/help/agencyebooksettlements. See also: Court Rules Against Apple's Attempt To Block E-Books Antitrust Monitor.